An incredible 8MP rear camera. The LG K8 V is a smartphone from LG Electronics, specially made for the Verizon Wireless network. It's based on the LG K8 which is sold worldwide, and it offers almost similar features. The gadget runs Android 6.0 Marshmallow out of the box, which is awesome given it's an entry-level smartphone. It also boasts a great spec sheet that includes a 1.3GHz quad-core processor, 5-inch display, and decent front and back cameras. Let's find out more as we go along in the review. 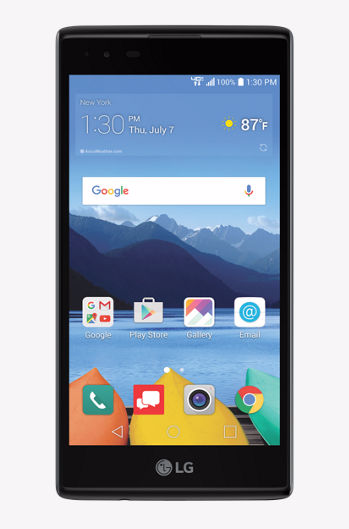 LG K8 V is available from the Verizon Wireless website. The packaging includes the gadget, pre-installed sim card, battery, wall adapter, standard USB cable, activation card, service guide and a quick setup guide. With Android 6.0 Marshmallow, setting up is straightforward. Let’s move on to the design phase. The LG K8 V boasts an impressive and sleek design that's incredibly attractive to the eye. While it's based on the earlier LG K8, the design is entirely different. The back cover has a soft-touch finish that feels really nice in the palm which is very distinct from the nylon backplate the LG K8 has. It has flat corners which look kind of nice and different given most phones have the slightly rounded corners design. The phone sports the volume rockers and power button on the back cover, a significant trend in LG smartphones. You will also find the back camera just above the buttons and the LED flash to the right of it. The back cover can be removed to reveal the battery compartment and slots for the SIM and microSD card. Coming to the front panel, you are greeted with the 5-inch touch display. With Android 6.0, the device will have the floating navigation keys as opposed to the physical keys in older Android versions. The top of the screen has the notification LED indicator, front camera lens, earpiece, and the proximity sensor. The frame of the LG K8 V doesn't hold much, given all buttons are on the back cover. You will find your noise cancellation mic on the top edge while the bottom edge has the headset jack, USB/charging port, and your microphone. That sums up our hardware tour around the device. The lens on the LG K8 V includes an 8MP rear camera and a 5MP front camera. If you ask me, this is an incredible pair of cameras you can expect to find on a device in this price line. What the cameras offer is even amazing. The back camera has a LED flash that will support capturing pictures even in low light settings. The front camera has the gesture shot feature where you can use your hand's gesture to capture selfies automatically. It's also wide angle, so you can capture more faces or rather a group selfie. Even with the LED flash missing on the front camera, the gadget has the LG's soft-light technology which helps produce amazing low-light selfies. The camera app is also very easy to use with buttons well placed for easy reach even with one hand. While the default mode has the necessary features to shoot pictures and videos with, you may also switch to pro mode where you get an option to tweak settings to your liking. You can make changes like ISO values, white balance, picture size, and more. Some regular features the camera support include burst mode, interval shots, panorama, geotagging, and HDR. Quick share is integrated into the camera, where you can immediately share your photos after taking without having to switch to a social media app. The camera can also record high definition 720p videos at 30fps. You may also take a photo while recording a video. I found this to be nice, especially if you are attending an event and are not sure whether you should take pictures or capture a video. The front camera comes in handy during video calling giving an enjoyable experience. The LG K8 V sports a 5-inch HD IPS display. The screen offers a pixel density of 294ppi and a resolution of 720 x 1280 pixels. For the price tag on the LG K8 V, this is nice and totally acceptable. With IPS LCD technology, it means a brighter and sharper display with excellent viewing angles. Similarly, the IPS technology goes low on battery consumption giving you even more hours of screen time. Like most LG smartphones, the screen also supports the "Knock On" feature – where you double tap the screen to sleep or wake your phone without pressing the power button. The LG K8 V has an internal storage capacity of 16GB, with only 9.3GB available to the user. For regular use, this is a quite sufficient memory. However, if you plan to have more data like games on the phone, then there's need for more storage. Luckily enough, the LG K8 V supports a microSD card for memory expansion up to 128GB. LG K8 V comes with a 2125mAh Li-Ion removable battery. The battery is rated to hold up to 12 hours of talk time and up to 16 days of standby. In my regular daily use, I was able to go a whole work day with the battery. However, for heavy use including video streaming and gaming, the battery could give me about 6 hours of juice. I found the LG K8 V to perform really well on battery. Interestingly, the battery is also removable, so you can always have a spare one to swap with in case the primary battery runs out. In my interaction with the LG K8 V, I haven't been disappointed a bit; this is due to the specifications it comes packed with. First, is the recent Android 6.0 Marshmallow which offers a great user experience, fluidity in navigation, and is great at multitasking. Secondly, the Qualcomm Snapdragon 1.3GHz quad-core processor combined with 1.5GB of runtime memory offers the device enough resources to handle almost all your daily tasks. With a few apps running in the background, the phone can operate smoothly - this is because the powerful quad-core processor and the 1.5GB RAM supports multitasking. The phone includes a range of connectivity features to facilitate communication with the world. This being a Verizon Wireless prepaid, call quality is impressive. The phone is 4G LTE enabled hence web pages load super-fast, and video streaming experience is great on the Verizon LTE network. Regular features on the LG K8 V includes Wi-Fi for connecting to hotspots, Bluetooth 4.1 for sharing files between nearby devices, and a standard USB connector that you can use to connect to your PC. Internal storage: 16GB. Supports microSD card for external memory expansion up to 128GB. Processor: 1.3GHz quad-core (Qualcomm Snapdragon MSM8909). Battery: 2125mAh Removable. Standby time up to 16 days. Talk time up to 12 hours.